Bar Graphs in the 2nd Grade can be Fun. Use our Bar Graph Video and Worksheet to Help Your Students. Learning Bar Graphs in 2nd grade can be fun, especially when students get to collect their own data. In our bar graph video we teach how to make a bar graph and how to solve a few problems with the graph we have made. 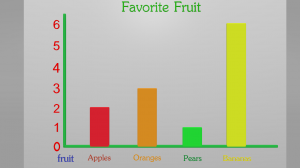 When learning about bar graphs we have found that it helps students the most when they see how to create a bar graph and that will in turn help them understand how to interpret other bar graphs. We hope you enjoy the lesson and if you have any comments please click on the contact us button. Thank you for all your hard work parents and teachers. Bar graph worksheet available on our worksheet page HERE.